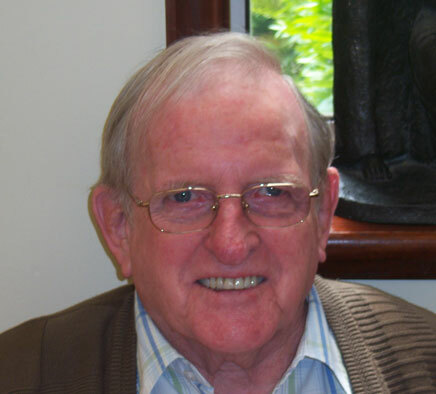 Fr Michael Cahill died peacefully at 9.35pm in St Theresa’s Nursing Centre, African Missions, Blackrock Road on Wednesday, 15 February 2012, aged 75 years. Four of his sisters as well as some close friends and SMA confreres had been with him throughout the day as his death approached. Michael Anthony Cahill was born on 6 October 1936 in Craughwell, diocese of Galway. He was the youngest of ten children born to William and Mary (née Forde). His brothers Sean, Jimmy and Liam predeceased him as well as his eldest sister, Margaret. After attending the Craughwell National School he did his secondary schooling with the De La Salle Brothers in Loughrea, a 14 mile round trip by bicycle every day. As Mick once said of that trip: “it toughened me up“. The Cahill home was a house of prayer, with the Rosary recited each evening. At the end of the Rosary Michael’s mother always had the family say ‘three Hail Mary’s for a special intention’. Many years later they found out that her intention was ‘for vocations to the priesthood and religious life’ and that prayer was answered when Michael decided to be a missionary priest (and two of his sisters entered the Mercy Congregation). The SMA has been blessed with many vocations from the west of Ireland and the Craughwell area has given more than its fair share to the missionary work of the Church. When the young Michael Cahill decided to enter the SMA Novitiate at Cloughballymore in nearby Kilcolgan, Co Galway he was accompanied by his cousin, John Haverty. They both became temporary SMA members on 24 June 1956. Michael became a permanent member of the SMA on 14 June 1961 and was ordained on 10 December 1961, one of 16 ordained in St Peter’s Church, Lurgan. It was the first Ordination ceremony to be televised by the BBC. Fr Michael was appointed to western Nigeria. He lived first at the SMA Regional House in Ibadan where, along with his classmates, he undertook the Tyrocinium programme – a six month course during which he learnt the local Yoruba languages and was initiated into the culture of the people he would serve for more than 35 years. Fr Kevin Carroll SMA, an authority of Yoruba culture, along with a team of local people ensured that the new priests were as well prepared as possible for their missionary work, no matter where they would serve in an area several times the size of Ireland. 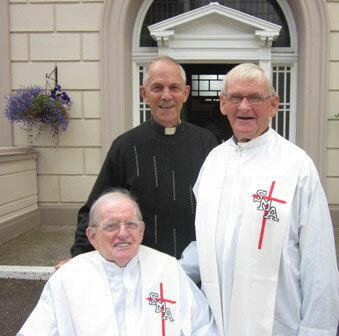 Our picture shows Fr Michael with his cousin and Ordination classmate, Fr John Haverty SMA and another Galway SMA, Fr Fintan Daly at the Golden Jubilee celebrations in July 2011. In October 1962 Fr Mick was sent to Ondo diocese, then under the leadership of Cork-born Bishop William Field SMA who had succeeded the first bishop of Ondo (Bishop Thomas Hughes from Hollymount, Co Mayo) in January 1958. Bishop Field was deeply committed to all aspects of the missionary apostolate, particularly education. He appointed the newly-arrived missionary to Usi-Ekiti. From then, until 1981, Michael served in the following parishes: Owo, Okitipupa, Irele and St Matthew’s, Ondo. In all these parishes, Fr Mick took a deep interest in the development of Catholic schools, be they primary or secondary, and was noted for the time he took to encourage both teachers and pupils in the different schools under his pastoral care. During his six years in St Matthew’s parish, Ondo, Michael helped initiate newly-ordained SMA and diocesan priests into the work that was required of them. He was a wonderful host and there was always a warm welcome assured for any one who called in to St Matthew’s. In July 1981 Michael was conferred with the Chieftaincy title ‘Basorun of Ondo’ by His Royal Highness the Osemare of Ondo in recognition of his work among the people of Ondo Town and beyond. From 1982 – 1988, Michael served as the FVC Director for Munster, living at the SMA House in Blackrock Road, Cork. This job entailed travelling all over Munster meeting with our FVC supporters who help us in the education of students for the priesthood. During that time he built up a huge network of, not just SMA supporters, but also great friends, many of whom deeply mourn the news of his death. As FVC Director, Michael returned to visit Owo in Nigeria and wrote an article in the African Missionary magazine about it. He is pictured here with some of the workers at the SMA House in Challenge. He returned to Nigeria in October 1988 and was asked to develop a similar fund-raising project in Ibadan, Nigeria for the SMA African Foundation which was attracting a large number of vocations to the missionary priesthood. In January 1990, Michael was elected as the Deputy Regional Superior, responsible with Fr Willie Cusack, for the SMA missionaries working in western Nigeria. At the same time he developed new outstations in St Leo’s parish, Orita-Challenge. In particular he will be remembered for opening St Anthony’s Church, Asipa. After completing his mandate as Deputy Regional Superior, Fr Michael was asked to take charge of the fledgling SMA Parish at Gaa-Akanbi in Ilorin town. He built the Mission House and developed the Church there. 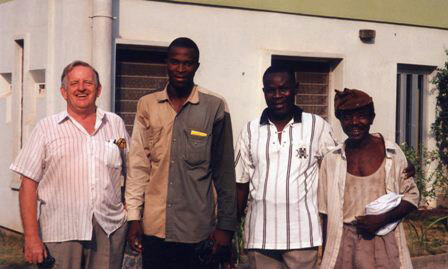 Michael’s missionary life in Nigeria was cut short when, on holidays in 2002, he had a serious accident in Cork. After a long recuperation, during which he displayed a remarkable positive attitude and confident faith, Michael returned to active ministry in April 2004, as Assistant Manager in the SMA Main Office, Blackrock Road. As well as dealing with correspondence and phone calls from SMA supporters etc, Michael also travelled around Munster for meetings and other SMA events. This allowed him to rekindle contact with so many supporters he knew from his time as FVC Director. Despite his accident and several other hospitalisations, Mick continued his work until forced to finally retire in 2010 due to ill health. 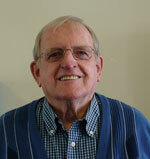 In December 2011, Michael celebrated the 50th Anniversary of his priestly ordination. Earlier in the year, when those of his classmates who are still on mission in Nigeria and South Africa were home on holidays, there was a Provincial celebration in Blackrock Road and many well-deserved tributes were paid to Mick and his classmates for their faithful service. Our picture, taken at Fr Michael’s Golden Jubilee celebration, shows his sisters, Sr Nora and Sr Maura, flanking Sr Margaret Kiely who is in charge of St Theresa’s Nursing Centre. Mick is survived by five of his sisters: Julie Cahill, Kathleen (Murray), Christine (Slevin) and Sisters Assumpta (Nora) and Maura, members of the Sisters of Mercy Western Province. His death is deeply regretted by them, his devoted nieces and nephews, other relatives, a wide circle of friends, both in Ireland and Nigeria as well as his confreres in the Society of African Missions.